Mirrors add light, expand space and distinctive style to any space. Octagon glass mirror with faux-shagreen border. Mirror hung vertically. Mirror with real buffalo bone veneer frame. Beveled mirror with faux shagreen frame and brass finished accents. A finely hand-carved solid wood frame in the Chinese Chippendale style with a classical pagoda crown. 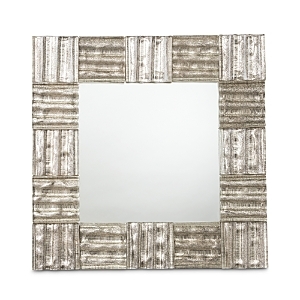 The antiqued silver frame surrounds a single pane of modern mirror. The Tayler Bamboo Mirror will make a welcome addition to any décor. This lovely wall mirror features a glossy white finish that will add a touch of boho to your home Handcrafted Pagoda frame in antiqued gold metal. Iron mirror and wood composite. The Chinoiserie door surround in the Supper Room of the Governor's Palace in Williamsburg, Virginia, inspired the Fincastle Mirrors. Bamboo texturing adds dimension and visual appeal to this octagonal mirror Grandly scaled etched mirror framed with gray faux-shagreen. 53"W x 79"T. Designed to hang vertically or horizontally; hanging hardware included. Mirrored glass, MDF, iron Mirror designed by Bunny Williams. Handcrafted of wood and mirrored glass. With influences of Moorish architecture a delicate cockbead molding traces the curves and lines of the inset beveled modern mirror. Gold iron Ginkgo leaf inspired rectangle mirror. Oval mirror framed by layered, real buffalo bone veneer discs. Beveled mirror with floral printed frame. Every house should have gracious mirrors – over fireplaces, in entry ways, back halls, powder rooms and of course, bedrooms. Similar to a lamination process but with a bit of a twist. With embossing, the intricate details are meant to pop-out. Capiz shells are harvested from the wild, shell has been delicately processed by hand to turn them into pieces of beauty and function. 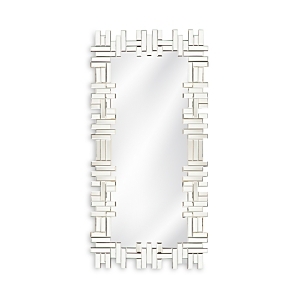 Framed by tiny rows of coconut beads and fringe, this mirror lends a textured touch to any space. Rectangular mirror wrapped with brick layered wood pieces. Brass-plated iron with handpainted tinted lacquer, brass decorative pearls with brushed finish, black engineered wood backing, mirrored glass Add a touch of glamour to your home with the dazzling Orson Mirror. 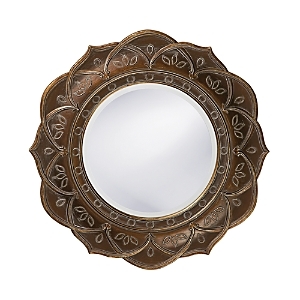 With a gold leaf finish, this mirror's unique style will enhance any décor. The twigs on this gorgeous mirror are made from sand cast brass that is painstakingly hand polished. Inspiration can originate from the simplest things. The Teak Leaf Collections began with a single teak leaf found in the woods by our master cabinetmaker in Vietnam. It was cast in metal along with a few others, then applied to the face of the acacia wood surface of the media cabinet. The large round mirror is a perfect foundation for the flowing leaf shapes. A statement-making piece for a bedroom, entryway, or living space, this mirror boasts a halo of hand-woven midrib fronds that are sourced from coconut trees. Scintillating natural mother of pearl lends luminous shine to this handcrafted Jamie Young mirror. Handcrafted beveled mirrored glass. Welded steel stainless steel frame with laser cut open wave pattern. Mirror surrounded by layered shell frame. Capiz shells are harvested from the wild, shells have been delicately processed by the hands of the Filipino craftsmen to turn them into pieces of beauty and function. Rectangle wall mirror with nickel finish metal frame. Round mirror surrounded by assorted driftwood pieces. Frame mirror with wood trim. Mirror made from metal and features a shiny chrome finish. Rounded corners and thin frame profile. All mirrored frame with clear mirror face Maximize your space with this oversized floor mirror, minimally trimmed with gold-brushed stainless steel. Backed with durable solid poplar wood, rest it vertically on the floor for a full-length closet companion or horizontally on any surface for a DIY vanity space! Round mirror with layered rope frame. Due to the handmade nature of this piece, no two are exactly alike. Driftwood, glass Mirror surrounded by reclaimed wood pieces. Beveled mirror with wood frame. Can be hung vertically and horizontally. Beveled mirror. Wood composite frame with gold leaf finish. Can be hung vertically or horizontally. Shaped beveled mirror with silver leaf finish frame. As brilliant as a newfound treasure trove, this glamorous mirror is an extraordinary find. The frame is crafted using large plates of semiprecious stones, created through purely organic processes. The dazzling array of colors and textures comes from the differences in elements that are infused while the crystallization process is in effect, which means each mirror the artisan creates will be truly unique in almost every way. 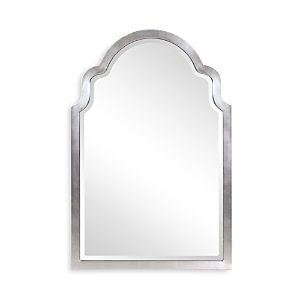 For a touch of added glamour, the mirror has a slight bevel. Slim in profile and minimalist in form, this contemporary piece gives a modern metallic tint to everything it reflects. 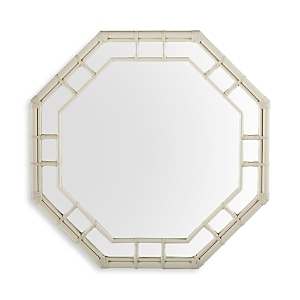 Inspired by sophisticated jewelry design, this geometric mirror is an elegant accent for any space. A simple antique brass finish frame is decked in an outer iron trim of dual-sized blocks, each featuring rich texture in a natural finish that looks both raw and hammered. The combination of these metallic tones and contrasting surfaces gives the mirror an organic modern look. Handcrafted floor mirror. Wood frame with black-lacquered and faux-horn finish and brass-edged corners. Beveled mirror. Handcrafted standing floor mirror. Hand-painted faux-horn wooden frame. 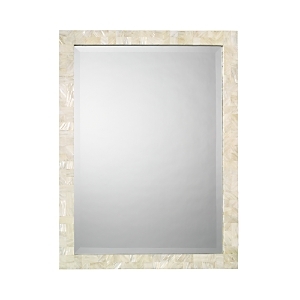 Rectangular beveled mirror plate. Stainless steel edged corners. Handcrafted floor mirror with animal-print fabric border. Alder wood frame. Polyester upholstery. Round mirror featuring seagrass border. Handcrafted framed mirror. Round mirror with wood frame in reclaimed finish. A multitude of textures and patterns are embossed on each of the individual brass strips which surround the convex Etoile mirror. Curved shagreen mirror. 48"W x 3"D x 84"T. Dyed hairhide (India) frame. Gold leaf detail. Beveled mirrored glass. Curved shagreen mirror. 48"W x 3"D x 84"T. Dyed hairhide (India) frame. Gold leaf detail. Beveled mirrored glass. Mirrored glass, MDF, brass Iron, glass Mirror made from metal and features a shiny chrome finish. Rounded corners and thin frame profile. Can be hung horizontally or vertically. Quatrefoil mirror with rope border. Supple leather embellished with cross-stitching details lends incredible texture to this Jamie Young mirror. 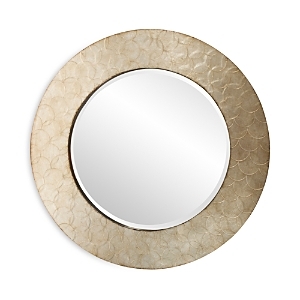 Layered circle mirror with antiqued brass finish. Aluminum-framed mirror. 32.25"W x 1"D x 60.62"T. Mirror featuring jute rope border. Mirror with large rope frame. Ribbed frame design Bathroom-rated. Brass, mirrored glass A modern mirror in a tear drop shape with a simple metal gold frame. Bohemian interior maven Justina Blakeney imbues her signature "jungalow" style into everything she creates. A play on her inspirations - jungles and bungalows - her designs are eclectic, colorful and always imaginative, and each makes a welcoming statement in your home. 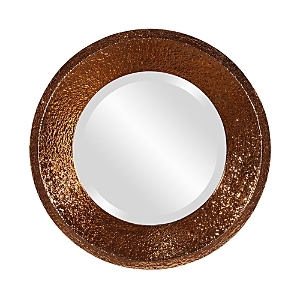 This concave mirror from Howard Elliott is hammered and finished in copper and gold to create a luminous, eye-catching texture Bohemian interior maven Justina Blakeney imbues her signature "jungalow" style into everything she creates. A play on her inspirations - jungles and bungalows - her designs are eclectic, colorful and always imaginative, and each makes a welcoming statement in your home.